10733 N. Bay Shore Dr. Located at the northern end of the Door County peninsula, Sister Bay is the best shoreline to enjoy the waters of Green Bay and points north. The Sister Bay Marina is located in the heart of downtown adjacent to the newly expanded Waterfront Park. In addition to serving the needs of boaters, the Marina offers boat rides, sightseeing cruises and bicycle rentals. While you are visiting Door County, enjoy the waters of Green Bay while you are taking advantage of all that Sister Bay has to offer. To learn more, click “More Information” below. 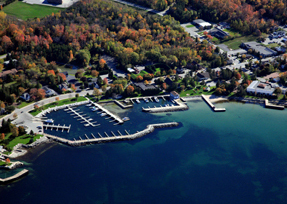 The Sister Bay Marina consists of 65 seasonal rental slips, 35 transient slips, and two commercial slips, and is equipped with showers and restroom facilities as well as a large, easily accessible boat launch ramp. There also is a Dock Masters office/lounge area for check-in/check-out. Friendly and efficient staff members are available to assist you with all your boating needs from approximately 9 a.m. to 5 p.m. May 15 through June 14, and from 7 a.m. to 9 p.m. June 15 through mid-September. The Marina includes electrical and water hook-ups, laundry facilities, one central pump-out station, Wi-Fi internet access, cable television service at the slips and bicycle rentals. There also is a television in the lobby, which continuously displays either Coast Guard Doppler Radar or the Weather Channel. Free long-term boat trailer storage is available at the Sports Complex on Autumn Court. Trailers may be left at the long-term area for up to six weeks. The Marina is in the middle of downtown and within walking distance of restaurants, shops, a beach, grocery stores, and boat repairs. Sister Bay restaurants were recognized as the Best Small Town Dining in the State of Wisconsin in 2008. Fuel is available 3/4 of a mile north at a fuel dock or across the street. Boat rides and sightseeing cruises are now available at the Marina on "D" dock. Shoreline Charters operates a USCG inspected 14-passenger vessel, which is equipped with a cabin, and Sail Door County operates a USCG inspected sailboat, which can accommodate up to six people. Both companies offer a variety of narrated cruises. Reservations are recommended, but depending upon availability it may be possible for you and your friends to decide to take a cruise on "the spur of the moment." The Sister Bay Marina is located at 10733 N. Bay Shore Drive and the phone number is 920-854-4457. Check the Village website www.sisterbay.com for rates and other information regarding transient slip rental, marina fees and charges and the contact information for charter activities.